So where’s the cheapest hotel room in Universal Orlando? While I’m not ready for the President Suite or 27 stones of Freddos just yet, Universal Orlando Resort have some more pleasing news for us all, which is that new hotels are being built, and they’re going to offer rooms for under $100 a night. The 750-room and 2050-room as-yet-unnamed hotels will be different to the budget Aventura Hotel, which is expected to open in August 2018. The cheapest room available there is $102. For comparison, a standard room in Cabana Bay is $129 per night, a basic Queen room in Sapphire Falls is $169 and rooms in Portofino Falls go for as much as $300. 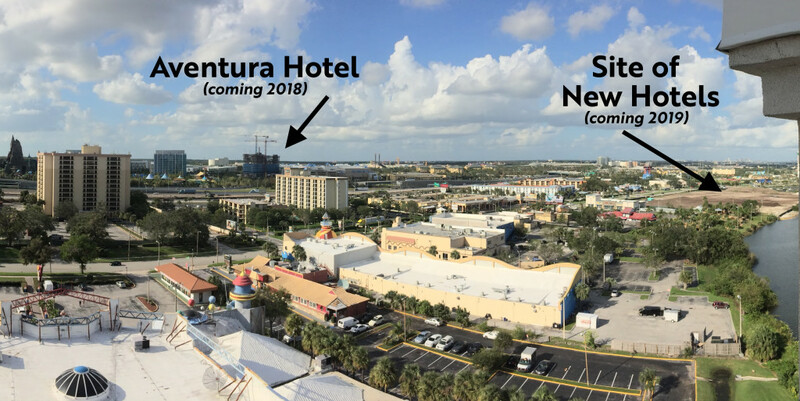 We saw both sites on our last visit and you can see from the image above the location for the new hotels – it’s where Wet ‘n Wild used to be before closing at the end of last year to make way for Volcano Bay. Universal are expected to open reservations early next year, anticipating opening the hotels in 2019. The hotels are said to feature a combined three pools, two food courts, coffee bars, poolside bars, fitness rooms and more, and stay within a few minutes’ walk of the parks and CityWalk. Universal Resort Orlando holidays may well be a fair bit cheaper come 2019 so keep your eye on these hotels for a budget break. If you can’t wait until then, don’t forget you can get your Universal Orlando tickets for 2018 on FloridaTix right now!